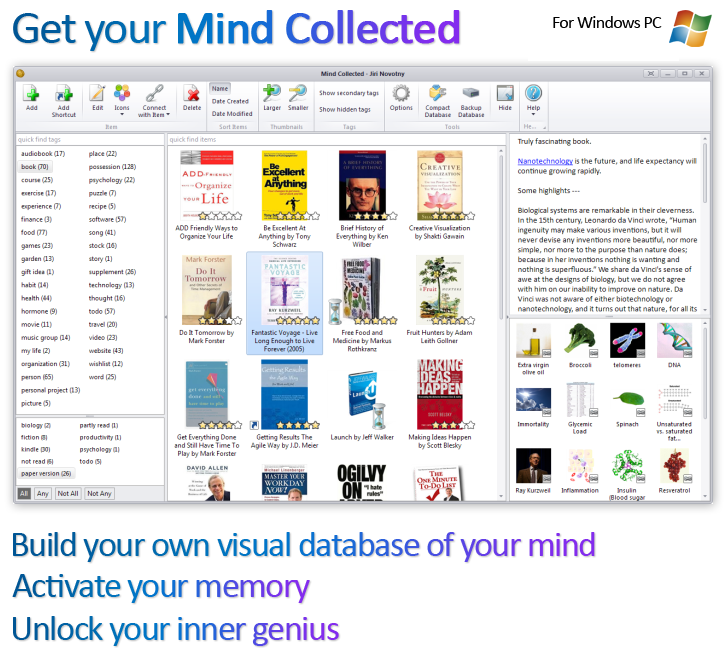 Mind Collected is a simple personal visual knowledge base for Windows with unique features. Visual: Every entry in your Mind Collected database has a picture. The picture can be auto-found on the Internet or you can provide it yourself. This allows you to visualize any piece of information. The entries are displayed in galleries as thumbnails. This allows you to utilize your visual mind and visual cortex in your brain. This is far more efficient than working with plain-text only data. Tag-based: Every entry in Mind Collected can have any number of tags. The tags allow you to organize information based on topics, areas, contexts, associations, etc. You can create multiple collections based on tags. Since entries can have multiple tags, any given piece of information can be in any number of the collections simultaneously. This is very powerful, especially compared to traditional knowledge bases, where every piece of information has just one given place. Automatically recognized sub-tags allow you to do additional filtering when viewing your entries. Item connections: Link entries to other entries easily. 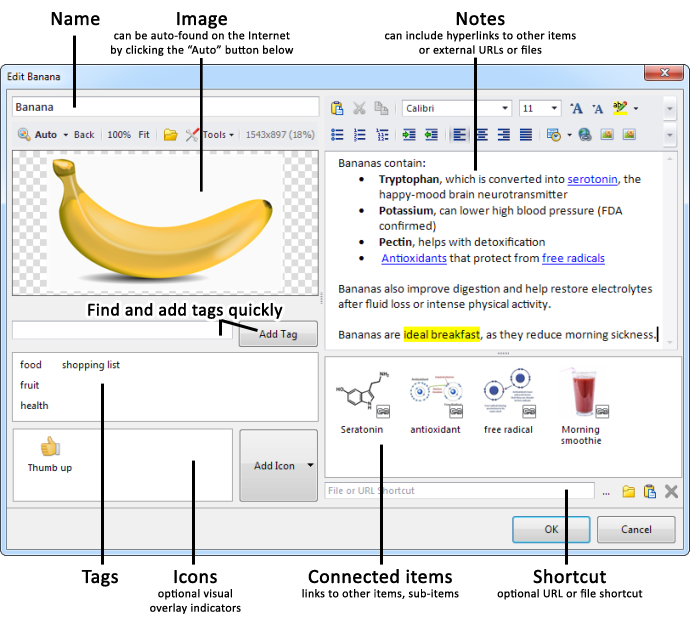 Having your visual knowledge base inter-connected makes navigation in it easier. It also helps you to remember all the information better and longer, because by linking the items, you will create visual mental associations in your brain. Rich notes with hyperlinks: Each entry has rich notes that you can use to store information. You can insert images, tables, apply all sorts of formatting styles. You can create hyperlinks, both to external URLs and files and to other entries in Mind Collected. File and website attachments: Entries can have sub-items that link to external websites (URLs), files or folders. This allows you attach documents to entries easily. Additionally, you can also assign a default file or URL shortcut to any of your entries – double-clicking the entry will automatically launch it. Fast as-you-type search: You can find any entry or tag in your database using a “quick find” field, which displays results as-you-type. Full text search that includes notes is also supported (just submit the query using Ctrl+Enter). Handle thousands of entries: Unlike mind maps, Mind Collected can handle thousands of entries without any problems. This is possible due to the powerful tag organizing and fast search. Minimalistic, light-weight and portable: Mind Collected allows you to focus on your information fully without any complexities or distractions. You can easily sync it using Dropbox or SkyDrive, or put it on a USB thumbdrive. Free 30-day trial: Download free 30-day trial for Windows and get started immediately.